Chicago—Over 100 people gathered in Chicago’s Federal Plaza on Aug. 25 for a vigil on the one-year anniversary of the massacre of the Muslim minority Rohingya. This vigil—with Rohingya refugees now living in Chicago, people from other Muslim countries and Black, white, and Buddhist participants—was one of many actions around the world for Rohingya Genocide Remembrance Day. Rohingya refugees fleeing Burma for India or Bangladesh on Sept. 16, 2017. Photo: CAFOD. In the name of Buddhist nationalism, atrocities by Burma’s military initiated the bloodiest phase of a still ongoing genocide that has now killed more than 10,000 civilians. It has forced into exile more than 700,000 Rohingya who have worked and lived in Burma, primarily in Rakhine state in Burma’s northwest, for as long as 300 years. Many speakers condemned not just Burma’s army, but also Aung San Suu Kyi, Nobel Prize winning symbol of 30 years of Burma’s mass resistance to the military dictatorship since the army bloodily suppressed the student movement in 1988. San Suu Kyi, as head of the civilian government, has little control over the army, but she has actively and loudly defended it. As late as the week of our vigil she was still blaming all its actions on “terrorists”—then justified locking up Reuters reporters. Speaker Azeem Ibrahim, author of The Rohingyas: Inside Burma’s Hidden Genocide, told how much the people of Burma hated the army, right up until popular resistance forced elections. Now, by demonizing the Rohingya, killing and expelling them, many people love the army. Since the worldwide vigils a UN report has condemned as genocide the military campaigns against Rohingya, even naming six high military officials. No one can drag them before the International Criminal Court as long as China would veto it. The UN report suggested the kind of Independent Commission that, far too late, investigated genocide in Rwanda and in Bosnia in the 1990s. 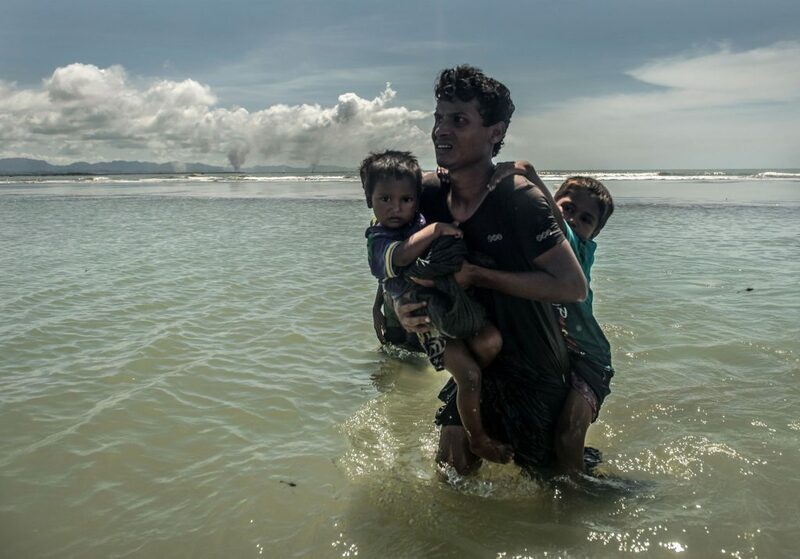 Importantly, the global outcry against the ongoing genocide against Rohingya must expand in order to stop these crimes now, and to bring the perpetrators to justice. This entry was posted in Articles and tagged Aung San Suu Kyi, Azeem Ibrahim, Bangladesh, Bob McGuire, Bosnia, Buddhist nationalism, Burma, China, India, International Criminal Court, Rakhine, Rohinya, Rwanda. Bookmark the permalink.